Since I got home so late, errrr, early, on Tuesday after Monday’s marathon, I was in bed until 11:00 am, then got up and wrote the blog post for Monday’s game. 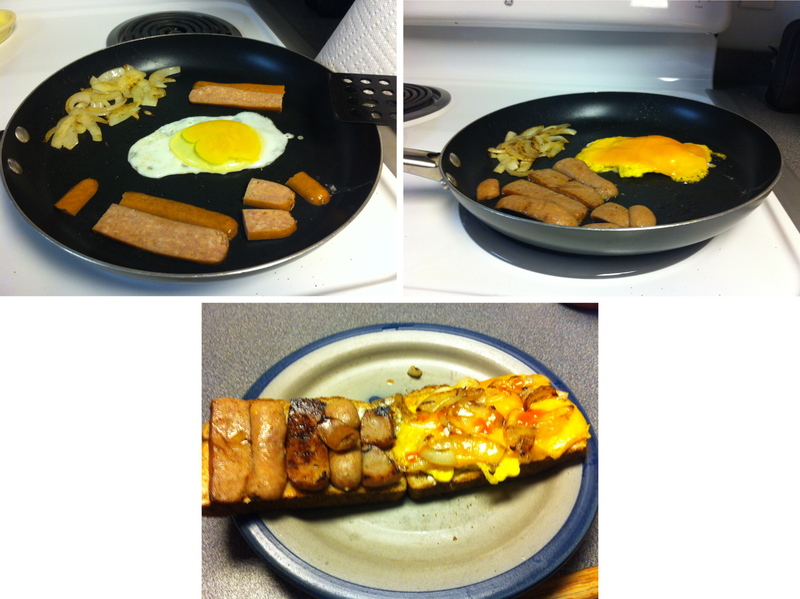 I made breakfast/lunch and it was amazing. I’ve been making it for a while now, but it’s just as good the 50th time as it was the first. I take a polish sausage and slice it into sections, so they’ll lay nicely on bread, then fry on egg, sauté some onions (and sometimes mushrooms), and throw the polish pieces on the skillet as well. When all that goodness is about done I toast some Brownberry whole wheat bread, put a little bit of mayo on both sides, and add some Frank’s Red hot on top. After the egg has been flipped and I know it will be done soon, I put a slice of cheese on the egg, turn off the stove, and cover the pan, which melts the cheese to perfection. Clockwise from top left is how it starts, top right is nearing completion, and the bottom picture is right before consumption. The sandwich is a little blurry, and I think I was in such a hurry to eat it that I forgot to hold still. I started getting ready for the game and packing for the upcoming road trip after I finished my breakfast-lunch. I left the house at 4:00 pm and pulled into the Brewers 1 parking lot at 5:13. I then spent 30-40 minutes traversing the parking lots handing out my business cards, and telling people about Be The Match. I worked my way inside at 6:00 and headed for the loge level. 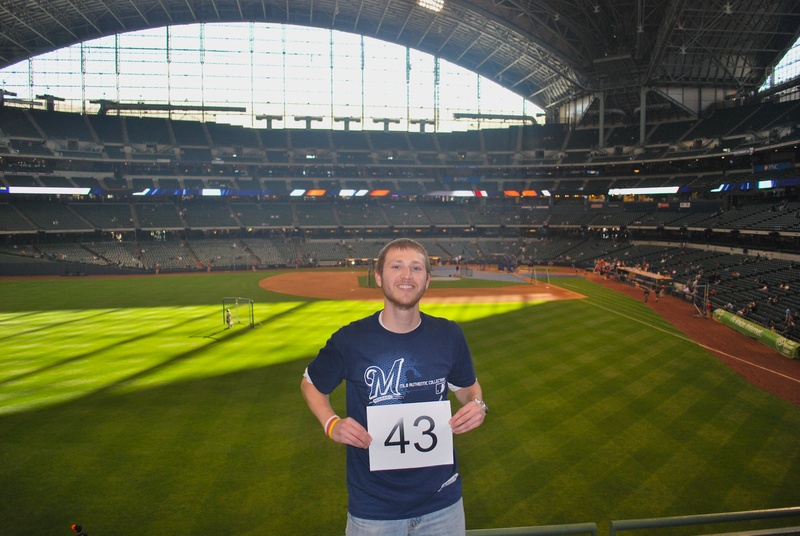 I went to section 236 for game photo number 43, and a nearby fan (who I learned is in the registry, yay!) took the picture for me. I had left the other ticket at will call for the Twitter auction winner, Jeff. Mark “The Doorman” had graciously given me his two tickets for Tuesday’s game, and I auctioned one of them off on Twitter. Jeff was the high bidder with an $85 offer, and I’ll be donating the money to Be The Match. I had also sold my two tickets for $40 to Tuesday’s game, so that and the $20 from last Friday means I’ll be making a $145 donation on behalf of those people who purchased the tickets. Thanks Guys!!! Jeff was already keeping the Doorman’s seat warm for me, and I made my way to the seats around 6:50. I got a fan behind us to take a picture of me and Jeff. 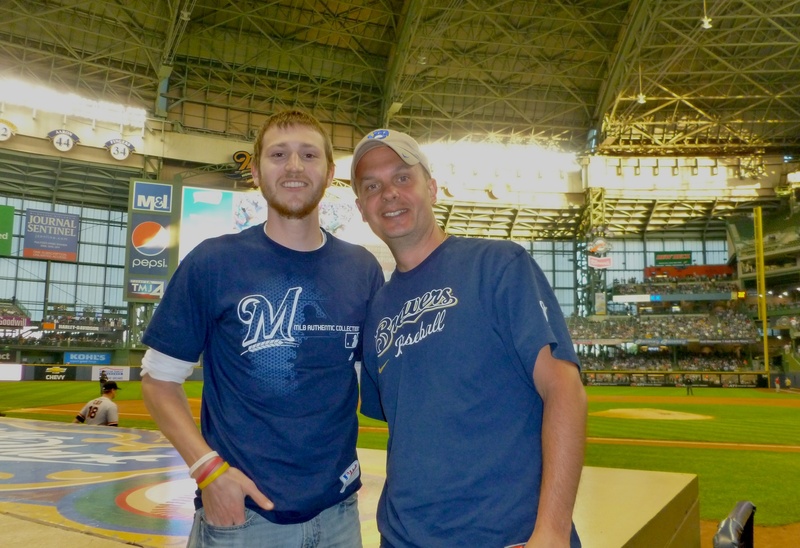 Jeff lives in Northern Illinois, but has been a Brewers fan his whole life. He told me that when he was a kid, it was easier to come up to County Stadium than it was to go to Wrigley or Comiskey, so the Brewers became his team. He’s a great guy and I’m glad I got to spend a game with him in some awesome seats. The game got underway and it was another rough start for the Crew. 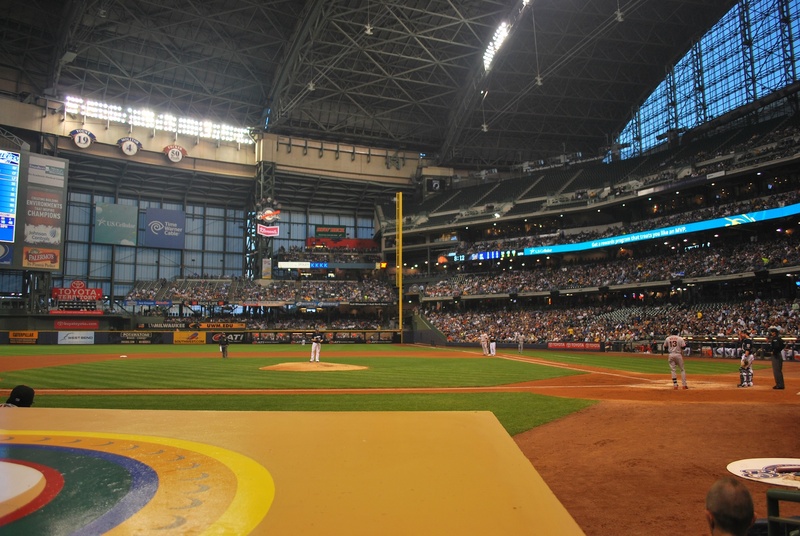 A ground rule double and a sacrifice fly each drove in a run for the Giants, and the Brewers were in a 2-0 hole after the top of the first. 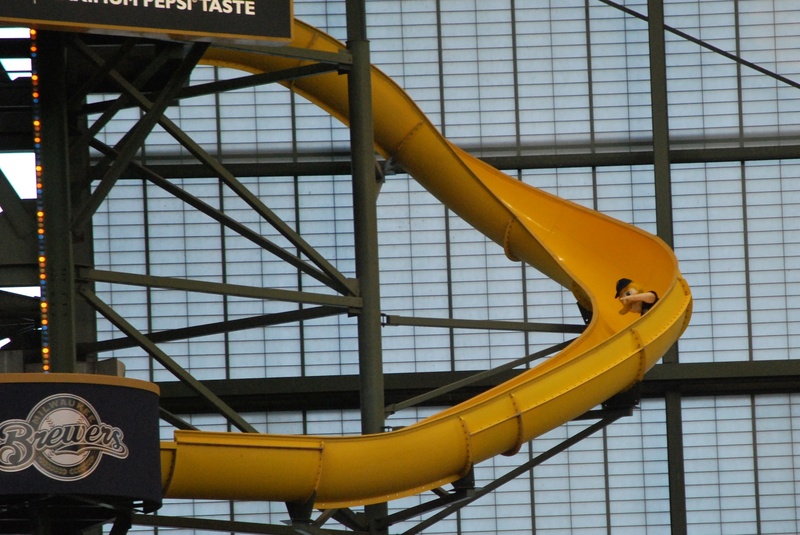 Bernie Brewer always goes down his slide when the Brewers are coming to bat in the first inning, and this time I got him mid-slide. Aoki led off the bottom of the first inning with a triple, which gave the Brewers an 85.3% chance of scoring at least one run in the inning. Nyjer Morgan lifted one to left, but Cabrera gunned down Aoki at the plate. 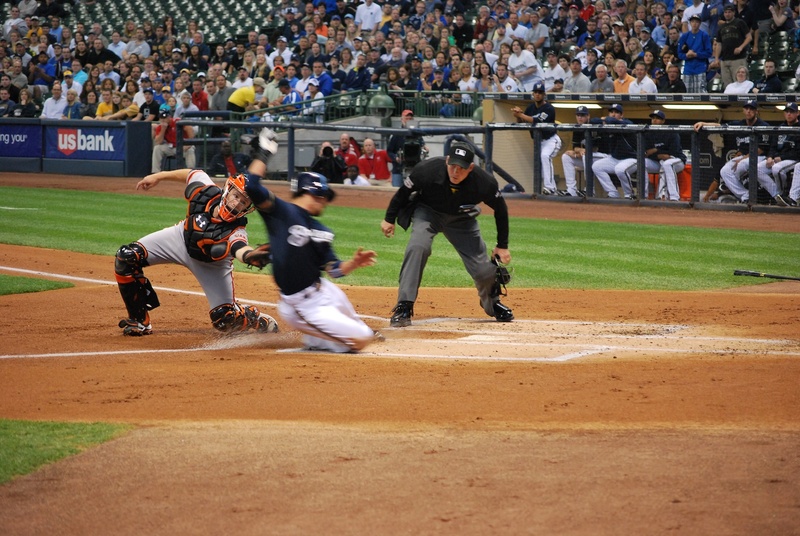 I know Aoki is blurry, but I still like the picture because the ump and Posey are frozen pretty good, and Aoki is the only one moving (or so it seems). In the fourth inning I took a picture of the view of home plate from the Doorman’s seat, not too shabby I must say. Unfortunately me taking the picture must have been bad luck, because later in the at bat the guy at the plate (Joaquin Arias) hit his first major league home run. It was a two-run homer and the Giants took a commanding 4-0 lead with their Ace on the mound. 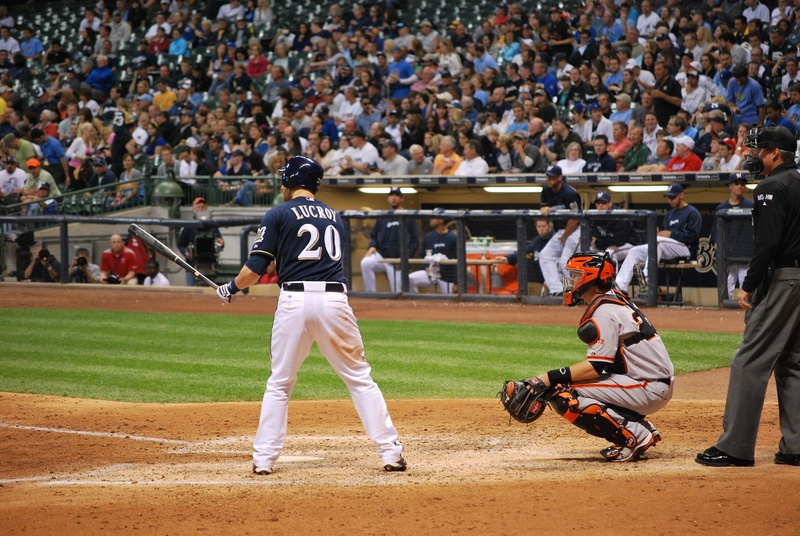 In the bottom of the fourth the Brewers answered when Weeks lined a scorching double to center that drove in two. 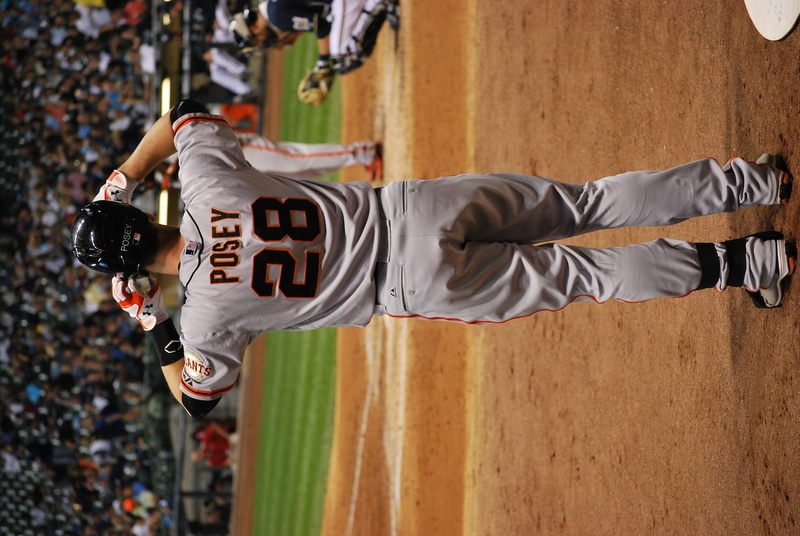 The Giants got both of the runs back in the sixth when Buster Posey (below) hit a two run home run. This is Posey making sure his helmet is on right prior to his sixth inning at bat. 2) The Polish sausage taking an early lead on the other encased meats. 3)Polish still in the lead, as Chorizo wonders how other sausages could be winning since he has the most kick. 4) The sausages after they’ve crossed the finish line (Italian had a comeback win), while Chorizo struggles to make it off the field. 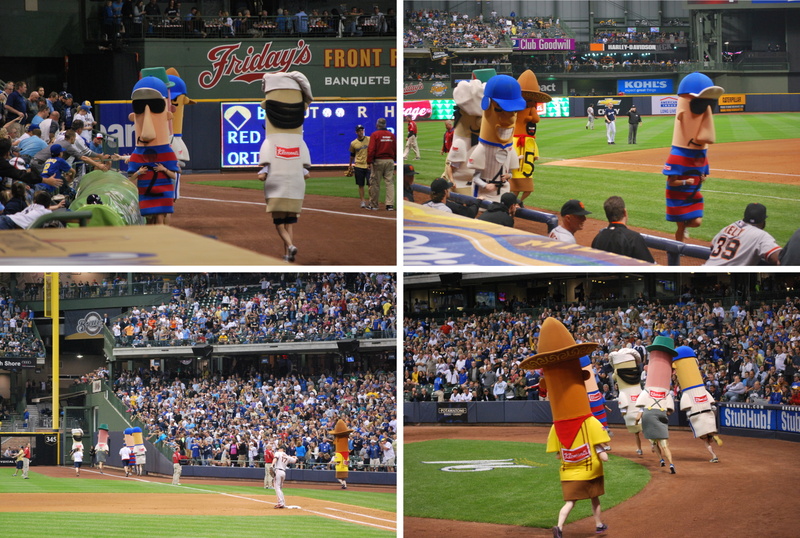 The sausage race didn’t immediately spark a rally, but one inning later the Brewers put two on the board and cut the deficit to just two runs. Unfortunately that would be as close as they could get and the Giants hung on for the win. Final Score: Giants 6 – Brewers 4. The Brewers tagged Matt Cain with four runs on eleven hits, but couldn’t get the W. Talk about frustrating. What makes it worse is that the Giants only had five hits, you read that right, FIVE, and scored SIX runs. The Giants only walked three times, but two of those runners scored, and that’s the difference in the ball game. 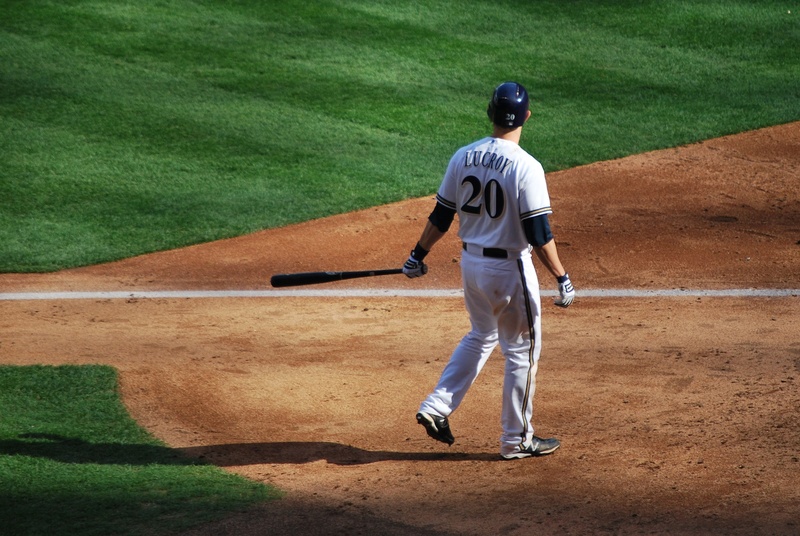 One last picture, I had posted a nice picture of Lucroy from Saturday’s game, and he tore it up on Sunday with two home runs and seven RBIs. I don’t think he needs it, but I’ll include this one of at the dish in the sixth inning, just for good measure. It’s past 2:00 am, and I need to get some sleep. First pitch is in about 10 hours, and then it’s off to MKE to catch a 6:20 flight to Denver. I’ll be spending tomorrow (Thursday) with my friend Dustin, and then we’re driving from Denver to Phoenix for the weekend series. It’ll then be off to Los Angeles for the four game set with the Dodgers.